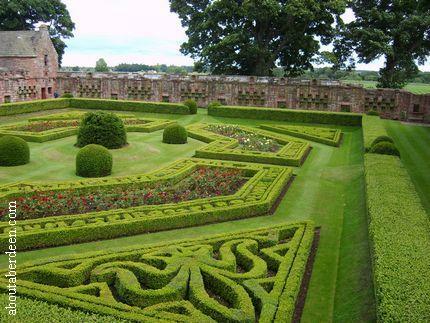 Edzell Castle and Garden is located on the B966 North of Brechin City, Scotland. It is now a ruin and owned and managed by Historic Scotland and open from March to October. There is plenty of free parking and disabled parking by the visitor centre. There is a small shop selling gifts, ice creams and drinks. This building also houses a toilet and disabled facilities. 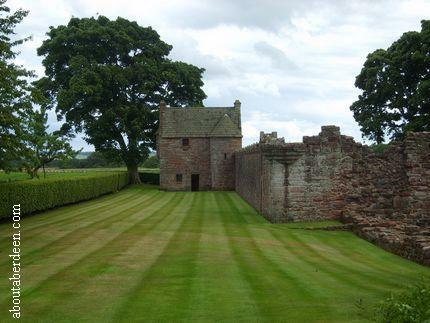 Wheelchair users and people pushing buggies can access the ground levels of Edzell Castle and the beautiful Garden. 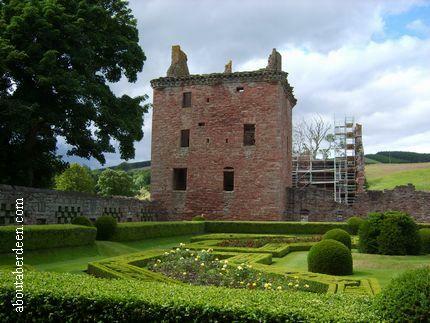 It is a short walk to the red sandstone Edzell Castle and this gives visitors a chance to see the eight peacocks that have made the grounds of Edzell Castle their home. This kept the attention of the aboutaberdeen kids. A short walk over some grass that would have been the motte takes visitors to the entrance to Edzell Castle, which would have been the back of the Castle. 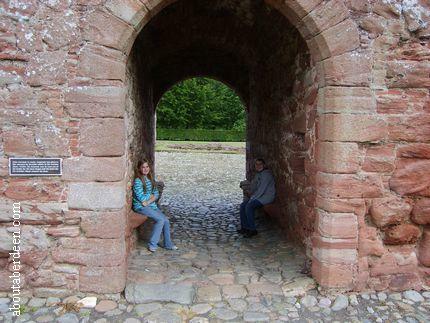 This is from a small walled archway which then gives access to the courtyard from the West Range. The foundation remains of staff buildings such as the kitchens, bake house, store rooms and outhouses can be seen. This area is thought to have been built in about the year 1550. Some of the large fireplaces can still be seen with views up their huge chimneys. The North Range is to the left and would have contained the Great Hall and a large kitchen below. The round tower rooms were probably private rooms. At the time of the AboutAberdeen.com visit this was being repaired and had scaffolding and no access signs. The original building work would have been started in about 1600. The Tower House can be seen and entered on the right side. Steep steps take you to what would have been the accommodation for the Lord, his Lady and their personal servants. It is thought that the 9th Earl of Crawford, David Lindsay and his wife Catherine Campbell built the Tower House in 1520. The mason's mark can still be seen on the doorway wall. In 1550 its windows were enlarged to match the new buildings and gun holes were added. An iron grill was added to the outside entrance. Today's visitors can enter the cellars and then make their way up the servant's stairs to small closets and the hall. More fireplaces can be seen along with latrine alcoves. The hall would have held a minstrel's gallery. The upper storeys held the bedchambers of the Lord and Lady and their guests. 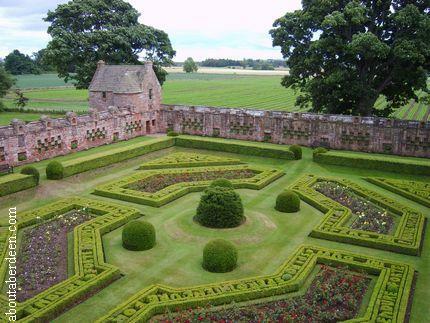 The Edzell Castle Gardens were created in 1604 and was known as the Great Garden. This walled garden still has the heraldic and symbolic sculptures in place. 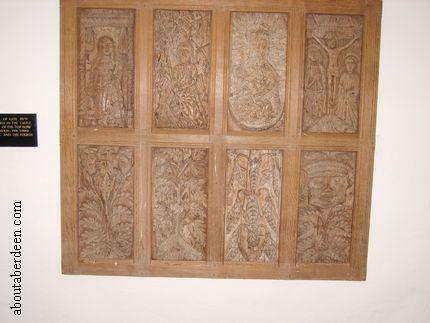 These include carved panels on the garden walls. These were themed the Seven Cardinal Virtues (Fides, Spes, Caritas, Prudentia, Temperantia, Fortitudo and Justitia) on the West Wall, the Seven Liberal Arts (Grammatica, Rhetorica, Dialectia, Arithmetica, Musica, Geometria and Astronomia) on the South Wall and the Seven Planetary Deities (Greek or Roman Gods of Luna, Mercury, Venus, Sol, Mars, Jupiter and Saturn) on the East Wall. Some are replicas and the originals are kept on display on the Summer House to help preserve them. Many of the recesses on the wall are filled with colourful flowerboxes. These have historically been white and blue lobelias to represent the argent and azure colours of the Lindsays Arms. Small compartments along the top of the wall were built so that birds could nest. The door leading to the garden are inscribed with the date and the coats of arms along with the Lindsay family motto which was DUM SPIRO SPERO which translates to While I breath I hope. The original entrance to Edzell Castle can be seen on the far wall of the walled gardens where three stone panels are still in place. These would have held the Lindsay coat of arms. The Bath House is seen on the right hand side of the walled garden and there is a well next to it which would also have provided water for the garden. In the opposite side of the walled garden is the Summer House where the owners of Edzell Castle and their guests could enjoy the view of the gardens and have some shelter and solitude. 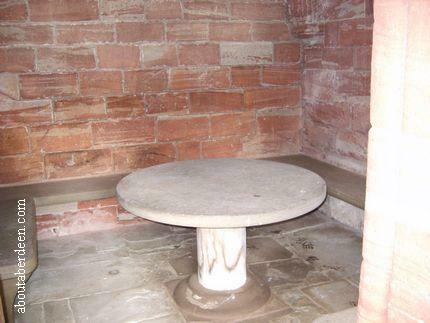 Food would have been eaten around the stone table and there is still the stone seating in place. The original seven planetary deity panels are found on the upper floor of this garden retreat. 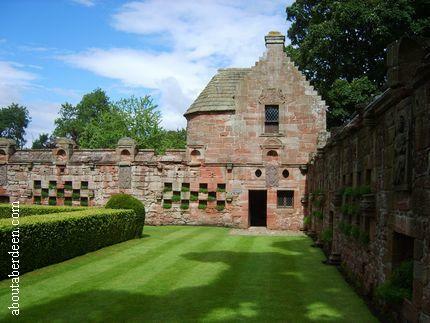 It is thought that Thomas Leiper the Aberdeenshire architect created the Summer House at Edzell Castle Garden. Edzell Castle was the seat of the Lindsays who acquired the Edzell estate upon marriage to the Stirlings of Glenesk in 1358. The marriage was between Katherine the daughter and heiress of Sir John Stirling and Alexander de Lindsay. The first castle was built about 600 yards away, near to the old parish church. This was built of timber by the Abbott family who were succeeded by the Stirlings of Glenesk. The present Edzell Castle, seen in the photos on this www.aboutaberdeen.com review, was built in the early 16th century. This explains the journey of the white lady ghost which is described further below. The main building would have been the Tower House. The original name of the village was Slateford and became Edzell in the 19th century. In 1381 Sir David Lindsay inherited Castle Edzell and was created the first Earl of Crawford. The Castle remained in the family and the 9th Earl, David Lindsay, built the Castle as it is today. Mary Queen of Scots made a royal visit to Edzell Castle with her son James VI in August 1562. On the second day of her visit she held a privy council to curb the rise of Gordon Earl of Huntly. James VI returned to Edzell Castle in June 1580 and knighted David. He returned again in 1589 and in 1593 David became a Lord of Session and then a Member of the Privy Council in 1598. Sir David died in 1610 and was in debt. This can be seen in the less ornate Cardinal Virtues panels when compared to earlier panels. Sadly he never saw his gardens completed. 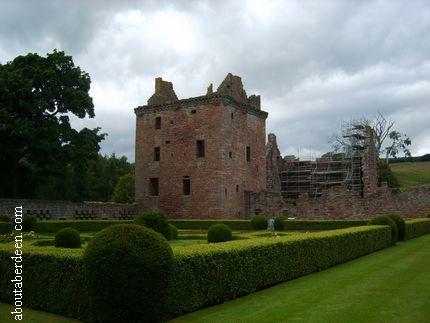 His son, also called David, inherited Edzell Castle and estate. He is noted in the history of Edzell Castle for murdering his cousin, Alexander Lindsay, during a fight in Edinburgh in 1607. During the Civil Wars of 1640s he became a Covenanter and defended Scottish Presbyterianism. Oliver Cromwell and his English soldiers took over Edzell Castle in September 1651 during his invasion of Scotland. His troops remained in the area for about one month and during this time the local population was greatly harmed. Debts mounted and David the last Lindsay lord had to sell the estate to the Earl of Panmure in 1715. He then worked as a stableman in the local Inn. Lord Panmure was later stripped of his ownership for his part in the first Jacobite Uprising of 1715 to 1716. 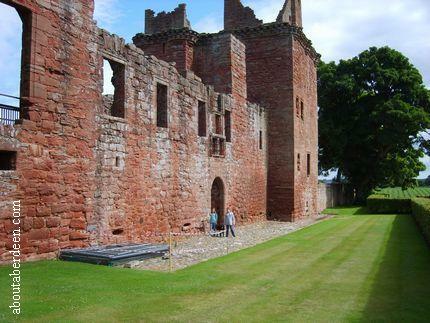 The York Building Company purchased the property and stripped Edzell Castle of its assets. In the 1745 Jacobite Rising the Government troops of Argyll Highlanders occupied Edzell Castle and it was badly damaged. By 1764 Edzell Castle had been stripped for building materials and fell into ruin. The estate was purchased by William Maule the Earl of Panmure of Forth. When he died his nephew, the 8th Earl of Dalhousie, inherited the Castle and Estate. By the early 19th century the ruins were attracting interest and a keeper was appointed by the family in 1879 to maintain the property and show visitors around. A keeper's house was built in 1901 and this now houses the visitor centre and shop. The garden was taken into state care in 1932 and then in 1935 the ruins were taken into state care. The garden was recreated and excavations began. Later excavation revealed the bath house. Dwarf box beds were created to show the Scottish thistle, French Fleur-De_Lis and the Rose of England. The motto and heraldry of the Lindsay family were also created within the borders. The official Edzell Castle souvenir guide on sale in the gift shop contains a drawing of Edzell Castle from around 1825 by the artist James Paterson. The white lady ghost of Edzell Castle has been sighted moving from The Lindsay Burial Aisle to the Castle. The white lady ghost was said to have been buried by error whilst alive. A villain went to rob her of the rings she was buried with and after digging her up he cut into her fingers to remove her rings. This drew fresh blood and the pain woke her up from her deep death like sleep. The thief ran off in fright and the woman made her way back to Castle Edzell. This was in winter and she hammered on the door of the Castle but no-on would help her or let her in because they thought she was an unquiet dead or spirit. She perished in the cold and her body was found the next morning and she was properly buried. 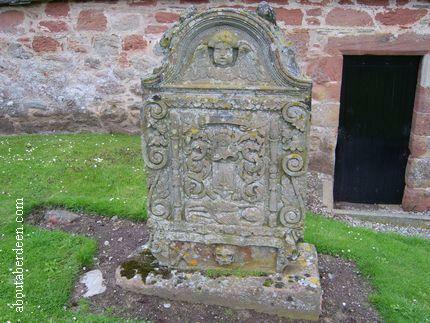 Her phantom is said to walk between her grave and Castle Edzell trying to regain access to her former home. Aboutaberdeen does not know the identity of the white lady ghost of Edzell Castle. The Lindsay Burial Site is located on the right hand side as you exit the Castle drive. It is about 300 metres away and there is free parking outside. It is found in the older part of the graveyard. This medieval parish church was dedicated to Saint Laurence and the remaining part, the Lindsay Burial Aisle was the burial place for the Lindsay family dating back to about 1550. Existing features include a basin for the ritual cleansing of vessels used in the mass, called the piscina. 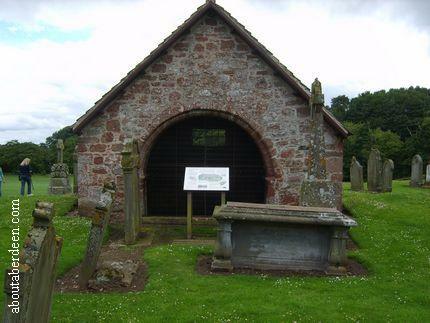 The original church was demolished in 1818 and a new Kirk sited in Edzell. More Ghosts And Ghost Stories of Aberdeen, Aberdeenshire and Scotland.